CPOE allows health care providers (e.g. physicians, nurses, therapists, pharmacists) to electronically order and process lab tests, medications, clinical procedures, and other services. Routing important requests for patient care occurs almost instantaneously. From the workflow standpoint, CPOE allows the provider to enter orders from any location (fixed or mobile) while simultaneously accessing the patient’s chart. Those orders are then transmitted immediately to the individuals responsible for implementing them, thereby increasing the efficiency of the entire process of care. Read more. United Regional Health Care System has bar-code based technology to further its commitment to improving patient safety. 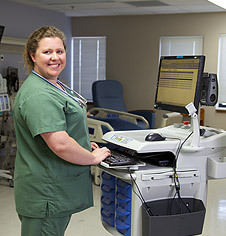 The bar-coded medication administration solution enables nurses to quickly and intuitively verify the five rights of medication administration – right medication, right dose, right time, right route and right patient – all to produce dramatic improvements in accuracy as part of an organizational initiative to improve care delivery. Read more. Providing caregivers with immediate access to a patient’s information not only improves quality and safety, but also reduces variation in patient care by using best practices. And, it improves care coordination across various practices. Read more.